Sunday morning means pancakes to me – especially so if it is frosty outside! I had a bag of shelf stable crumbled bacon left over from my cooking presentation this week so I got to thinking…..it would be tasty added to pancakes. And it was. I added in about a 1/4 cup to the pancake mix (made a double batch of pancakes). 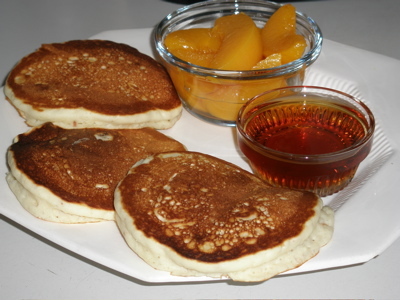 Whipped up the pancakes, cooked them on the griddle and plated up with maple syrup and some peaches. Now…off to figure out my day!